I am delighted to write a short foreword to the history detailing the first one hundred years of The Lilley Ellis Lodge. The history provides an interesting insight into the social conditions of the times, not only in Birkenhead but throughout The Province of Cheshire. The Centenary is a moment to pause, reflect and give thanks for the past, whilst renewing our commitment to the future. We read of events in the early and middle periods of the Lodge, finally bringing us to the present day. Evenings of happiness contrast sharply with those of sadness reflecting the national and personal circumstances of all those involved; but underlying and underpinning these contrasting moods has been the continuing sense of fidelity pervading all the Lodge meetings. I wish the Lodge every success in the future and may there always be an abundance of prosperity, happiness and peace amongst its members. W.Bro. Lilley Ellis, P.A.G.D.C. (England) was a local businessman and lived at 9 Rock Park, Rock Ferry, Birkenhead. His company was a Ships Chandler & Dye Works. It is only recently that his works building (Next to the Town hall) was demolished. Masonry obviously meant a great deal to him, as he devoted many hours to it. He was a Cheshire Mason who was initiated into Zetland Lodge No.537 in 1877. He was also a Joining Member of Rock Lodge No.1289 and was their Worshipful Master in 1874. He was also a member of Unity Lodge 321 and served as Worshipful Master in that Lodge in 1899. He received his first Provincial Honour as P.P.G.D. in 1885 and was promoted to the rank of Past Assistant Grand Director Of Ceremonies (England) in 1899. W.Bro. Lilley Ellis was also promoted to Deputy Provincial Grand Master of Mark Master Masons in July of 1907. He served on the Committee of Benevolence for Cheshire for 15 years including Chairman and ice-Chairman, also a Vice-Patron for the Royal Masonic Institute for Girls, Life Governor for Royal Masonic Institute for Boys and the Royal Masonic Benevolent Institute for Aged freemasons. He had done many fine works for charity and in recognition of this the Lodge was named after him. The Senior Warden, Bro. Arnold Bloom, J.P. was the Lord Mayor of Birkenhead at the time of our consecration and died 22nd December 1910. The Junior Warden was Bro. William Price, died 22nd October 1912. Our first Treasurer was W.Bro. Joseph Clarke, P.S.G.D., by profession an Accountant and resigned 30/6/11. In a report printed in the Birkenhead Advertiser. (See later in this History), it was interesting to note that our first Worshipful Master was W.Bro A. J. Thompson P.P.G.Swd.Br. was by profession “The Editor of the Northern Freemason” which was the only paper of its kind in the North of England, and he resigned from the Lodge on the 30th June 1911. The bye-laws and original costs appear later in this history, but it is interesting to note the bye-laws have altered very little. The Lodge had 60 founders (though only 44 founders appear on the Original Summons), a record in those times. Lilley Ellis Lodge was to have some quite famous members, Lilley Ellis, himself and W. Bro. Lord William Hesketh Lever, M.P. being just two of our distinguished members, also James Thompson and Albert Coveny who have had lodges named after them. One name that we still have an association with is that of, Charles George Rickard Stephens, whose son was W.Bro. Lewis Stephens (who died on 25th July 2000), and his grandson Jeremy is a member of Lilley Ellis. We have had other members who were also celebrities for the time we have been in existence: Bro. James Ellis was a football hero of the time, playing for a local side. One other name to be conjured with was that of the famous Music Hall Star: Bro. Harry Lauder, who died 26th February 1950. He became a member through his friendship with the manager of the Argyle Theatre who was also a member, Bro Lauder was a Joining Member on the 26th of March 1908 his profession in our records show that he was a “Artiste”. One of Bro. Lauders famous songs was Keep Right On To The End Of The Road, which many people will know. Bro. James Gillies was a member of the ships crew on the S.S. Jacob Rupert, which was the Admiral Byrd Expedition to the South Pole in 1935. Sadly, on the 7th of December 1910, saw the death of our founder: Lilley Ellis. Lilley Ellis Lodge has met at three different venues since its start. It first met at the Masonic Chambers, 9 Hamilton Street, Birkenhead on the fourth Thursday in the month at 6.30 p.m (9 meetings a year) with Installation in May. and has since moved to the Masonic Hall, Oliver Street, Birkenhead, and also moved for a short period on the 1st of January 1996 to Hulme Hall, Port Sunlight, and returning to Oliver Street, for our September meeting in 1997. Due to dwindling numbers, in 2003 we dropped our September Meeting thus reduced the number of meetings, per year, from 7 to 6. In 1930 the May and June meetings were dropped and Installation moved to September. However the Lodge did meet during the summer months from 1942 for a few years. 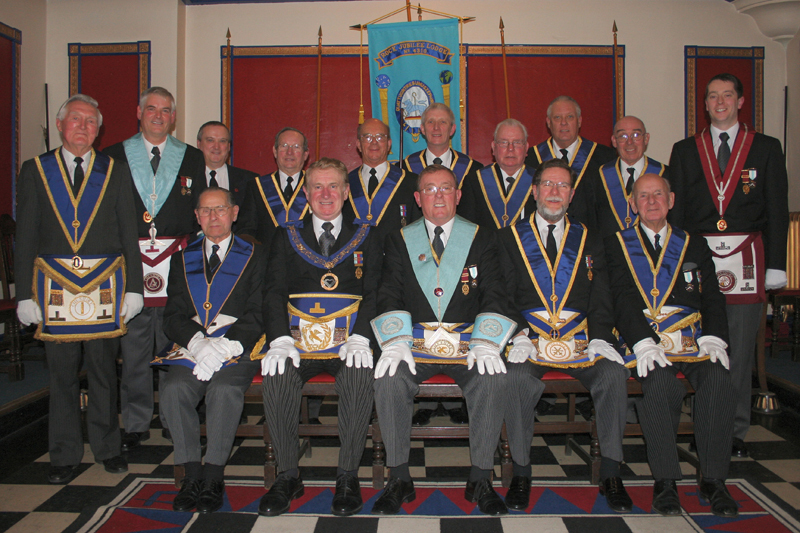 In 2004 we dropped the September Meeting and moved Installation to October. After reading through the Lodge Registrar it is obvious that the member’s professions have changed greatly: Some of our earlier members were registered as gentlemen or said that they had private means; It is quite noticeable however that some of these ‘gentlemen’ were expelled for non-payment of fees. (We do not know however, if they were withholding their Fees on principle or hardship – as history shows that times were hard during the years after the First World War). The outbreak of the Second World War saw the Lodge Meetings varied, with various Officers being called up for their services. Festive Boards were handicapped by Food Shortages and/or Rationing. Ladies Nights continued and W.Bro Ducket, who was a Master Confectioner, was a great help. A little matter of Adolf Hitler did not stop Lilley Ellis Lodge from holding their Ladies Nights. I have observed the Summons, during these war years, were printed on the thinnest of papers – another sign of rationing. From an old balance sheet in 1947, where Bro. P. Griffiths was the Master, his Ladies Evening Accounts showed that the tickets were 15/- each and 138 were sold and the buffet was the most expensive item on the account at £24.12s.0. then came the wines and spirits at £21.3s.3d. and the turkeys cost £18.4s.0. the whole evening cost £129.18s.3d. W.Bro. Albert James Thompson, P.Pr.G.Swd.Br., of Minarva Lodge No. 2433 was presented to W.Bro. Lilley Ellis, P.A.G.D.C., by W.Bro. Frederick Broadsmith, Prov.G.Secretary and was duly Installed in the Chair of King Solomon according to ancient custom. The Installing Master being assisted by W.Bro. J M McLeod, P.G.S.B. and W.Bro. A. C. G. Wallace, P.Pr.G.D. 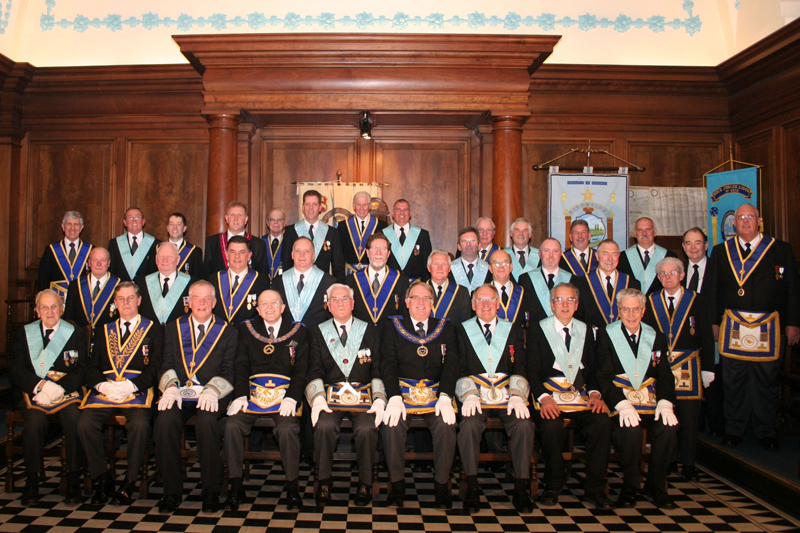 Following the Installation of the Master, 25 Joining Members were proposed and 5 candidates also proposed. At the next Regular Meeting of the Lodge on 27th June 1907 the joining members were balloted for, and approved. At the same time the 5 candidates were balloted for and having been unanimously approved, were Initiated into the Lodge. The meetings of the Lodge were held at the Masonic Chambers, 9 Hamilton Street, Birkenhead until 25th April 1912. Dispensation was received from the R.W.Provincial Grand Master enabling the Lodge to meet, for the first time, at the Masonic Hall, Oliver Street, Birkenhead on 23rd May 1912. There was no celebration of this milestone, formal or otherwise. This event was celebrated on the 28th March 1957. We were honoured on that occasion by the presence of the R. W. Deputy Provincial Grand Master, W.Bro Joseph Wainwright, O.S.M., P.G.D., and the Assistant Provincial Grand Master, W.Bro. R O Lloyd, O.B.E., P.G.D., accompanied by other Officers of Grand and Provincial Grand Lodge. The Worshipful Master, Bro Charles Phillips, vacated the Chair so W.Bro. Wainwright could deliver an address appropriate to the occasion. W.Bro Phillips then resumed the Chair and presented a cheque to W.Bro Wainwright for the 1957 Festival. W.Bro. Wainwright then presented the jewels to the brethren of the lodge who had qualified as Stewards of the festival.